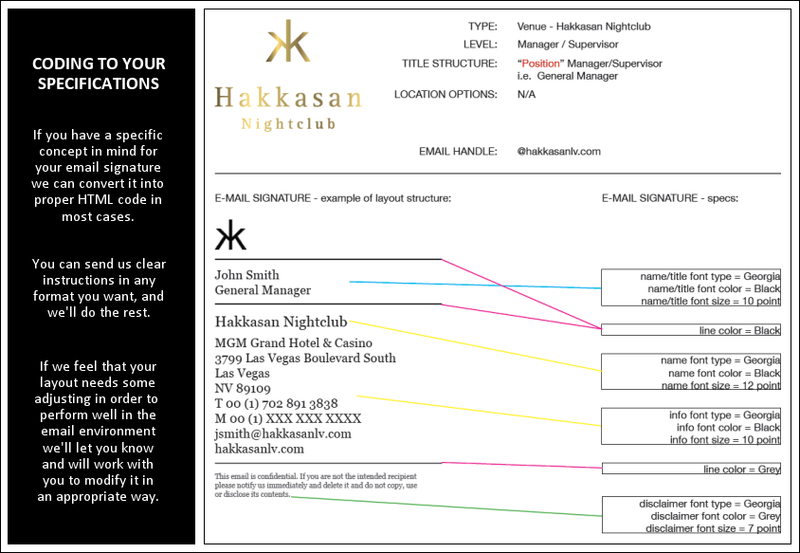 We’ve focused almost exclusively on the design and coding of email signatures since 1999. As a result, we have a large collection of extremely well field tested signature templates to work from. Email signatures are surprisingly difficult to code, and until they have been thoroughly tested across email clients / devices / operating systems / and configurations there is a great deal of uncertainty as to how well they will withstand the rigors of the email environment. For each project we employ the most appropriate of the following design & coding approaches. Mixed Text and Graphics : view gallery : This style combines some graphics (logo, social media icons, and sometimes the user’s photo) with HTML stylized text to create the finished signature. This is definitely the most common and popular style of email signature, and is one that achieves an optimal balance between visual impact and branding and overall reliability. We recommend this style to over 90% of our clients. Text Only : view gallery : Image blocking and the other (occasional) potential display problems associated with graphics are eliminated entirely through the removal of all images. Some logos can be fairly accurately rendered using stylized HTML, although many can not. If you value reliability significantly more that you value the visual aesthetic and branding offered by an email signature, then a text only design may be the best for you. Text Merged onto a Graphical Layer : view gallery : Sometimes a design is complex enough that the single most reliable way of creating it is as a single graphical image. When this is the case we can offer a graphical rendering engine that will automatically merge user entered text (name, title, phone number, etc.) onto a background image, resulting in a single image that can be used in an email signature. We typically do not recommend this approach as it’s not without drawbacks, but we do keep it available as it is sometimes the only viable option. Coding Customer Design Concepts: Although we usually take the lead in terms of design, it’s because we code everything by hand that we can almost always execute a signature that meets the most exacting desires of our customers - even if these are obscure or complex.